President Ibrahim Mohamed Solih has stated that the aim of the government is to enable access to a financial burden free, quality higher education while staying in the Maldives. He stated this while speaking at the ceremony held to inaugurate “Free Education Scheme for Degree Students” at Maldives National University this morning. During the ceremony, the President noted that the main objective of providing free education for first-degree students is to minimize the load the parent and students have to take in attaining higher education. Speaking in this regard, the President emphasized that this government especially prioritizes education because an educated generation is one of the key components of achieving development to any nation. He further emphasized that educated youth play a very vital role in nation building and underscored that for this reason, the government has allocated a high percent of reserve from the budget to the education sector alone. 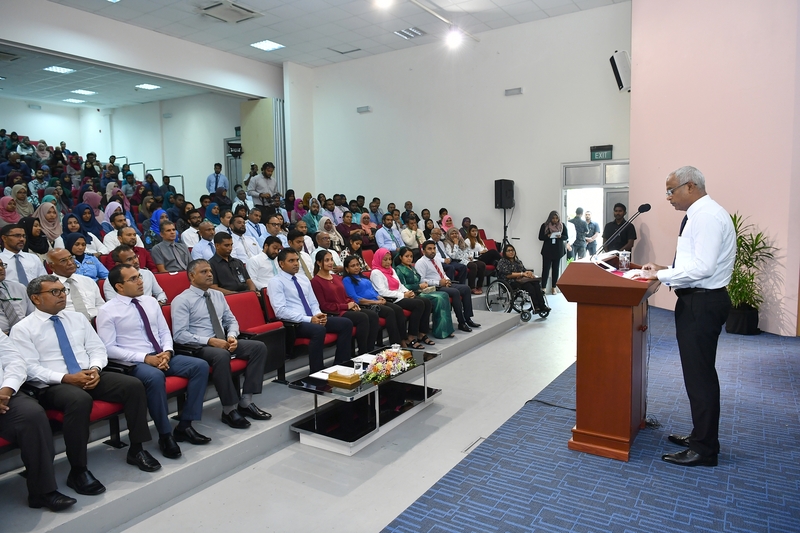 Moreover, the President stated that the opportunity opened for the Maldivians today is one of a kind opportunity and urged everyone who wants to study to use this golden opportunity to achieve higher education. He further stated that development is directly linked to the human intellectual capacity, thus this government’s focus is on human intellectual development first. Furthermore, President shed light on the fact that today we are working on building the leaders of tomorrow and that Maldives would decide its course of progress from the amount of awareness that comes to these educated minds. Speaking more at the ceremony, the President called upon the youth population to fully utilize this opportunity and to assist and contribute to the national development.